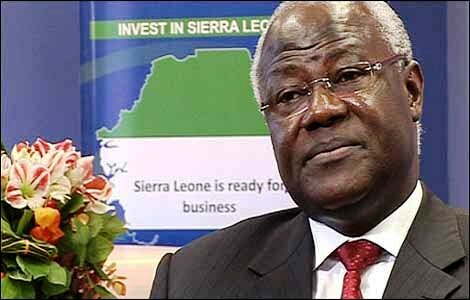 Freetown -- United States-based organization Universal Peace Federation has bestowed the "PEACE MEDAL AWARD" to Sierra Leone's president, Ernest Bai Koroma for what the federation referred to as his desire for peace not only in Sierra Leone but in the African continent. Introducing the special envoy of Rev. Moon, Katherine Rigney of the Universal Peace Federation, to President Koroma, the vice president of the federation in Sierra Leone Alice Kamara said she was first sent to Africa in 1975 and has served in Benin, Cote d'Ivoire and Nigeria, adding that as the African director, she has visited almost all African countries. Mrs. Kamara informed that the special envoy has conducted many educational programs in Africa with a special focus on character education and HIV and AIDS prevention. She said the envoy was here to deliver a special message to the president and to inform him about the award. Delivering her special message from Rev. Moon to President Koroma, Katherine Rigney said God was working positively through him and that Mr. Koroma was an important figure working for peace in Sierra Leone and Africa. Sierra Leone, she said, was an example of peace for the world. She requested a piece of land for the federation for the purpose of building a 'Peace Embassy' in Sierra Leone. She told President Koroma that his work since taking up office has admired Rev. Moon and that he would like to support the president in all forms including spiritual support. Ms. Rigney said the award was in recognition of the president's desire for peace and the maintenance of the same, not only in Sierra Leone but in the African continent. She extended an invitation to Mr. Koroma on behalf of Rev. Moon to visit the United States. In response, President Koroma thanked the special envoy and Peace Ambassadors for the visit and the message delivered. He expressed his profound gratitude to Rev. Moon through the envoy for the award and promised to visit to the USA to collect the honor. According to President Koroma, peace was an instrument to usher other good things and to sustain it to enable people work together and feel wanted as one people. "With all his wisdom I would like to visit and sit with Rev. Moon. Peace is hard work and self confidence and government will encourage all to work together in peace to develop the nation," Koroma said. He added that as a nation in a transformation period, it was difficult but would last through the will of the people, while stating that land would be provided for the erection of a Peace Embassy in Sierra Leone. Also present as ambassadors were the secretary general Rev. John D.S. Samura, Rev. Adama Doumbia and Haja Afsatu Kabba as chairperson. In separate engagement, President Koroma on Saturday formally launched the Golden Jubilee Cleaning and Beautification Project at the Brima Attouga mini-stadium in the east-end of the capital. Organized by the Sierra Leone 50th independence anniversary celebration committee, in collaboration with the Freetown City Council and All Works of Life (AWOL), the occasion saw the participation of the bike riders, market women, amputees and members of the public. Chairman for the occasion, Leonard Balogun Koroma said: "We are celebrating all the natural resources, the maintenance of peace". Moseray Fadika, AWOL's godfather, thanked God for having a leader like President Koroma "through whom all good things have come for the country". Formally launching the occasion, President Koroma reminded all present that on April 27 the nation would be 50 and that there was need for Sierra Leoneans to celebrate. He thanked all those who had fought hard for Sierra Leone to attain independence. According to the president, this was the time for all Sierra Leoneans to come together to develop the nation. He affirmed that, "We should now sit and reflect on our past and look at our mistakes, amend them and try to push our nation forward". He commended the anniversary committee, Freetown City Council and AWOL for tirelessly working towards the successful celebration of the day, noting that "this should give us all hope as one people". With regards the cleaning exercise, he said it was a step in the right direction and that the nation has a future to transform itself, adding that from date "no one should slow us down as we should move on as one family".